Scarecrows are not of recent origin and do in fact originate from more than 3000 years ago. The scarecrow was a means that were used by Ancient Greeks for protecting their crops from birds. They were also regarded as God to worship - Priapus, the god of farmers and a guardian of crops. The Egyptians of old also made scarecrows, although they were not always constructed of the same materials as the present time. It was after many centuries that the English made their figures of straw with turnip heads. Throughout Europe and the Americas scarecrows were made and developed in each country as an art form, the ideas became more ingenious and today the amazing conceptions have provided and combined competition with enjoyment and fund raising. In other parts - Jack of Straw, Scarebirds. 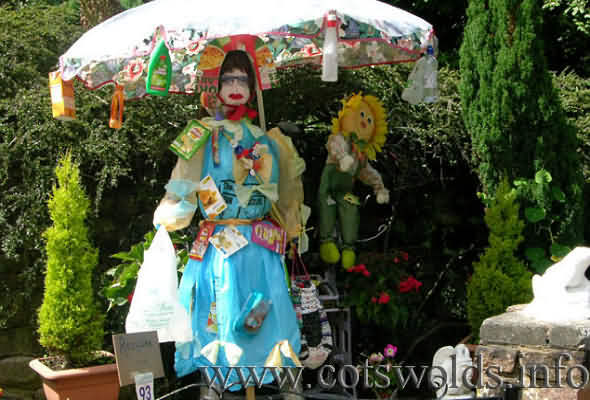 Scarecrow Festivals are held throughout the world and attract huge crowds and are certainly a tourist attraction and bring trade wherever they are held. Usually a theme is chosen. They can be combined with other events, such as Antique Fairs , Arts and Craft sales to add greater interest. Amongst the many local successful scarecrow events held in the Cotswolds were the ones at - North Nibley Gloucestershire, Thornbury Gloucestershire, Urchfont Wiltshire, Powick & Callow Worcestershire, Belbroughton Worcestershire, Feckenham Worcestershire and Bromyard in Hereford.